Sleepytime tea is herbal tea prepared by Celestial Seasonings, containing chamomile, spearmint, lemongrass, tilia flowers, blackberry leaves, orange blossoms, hawthorn, and rosebuds. 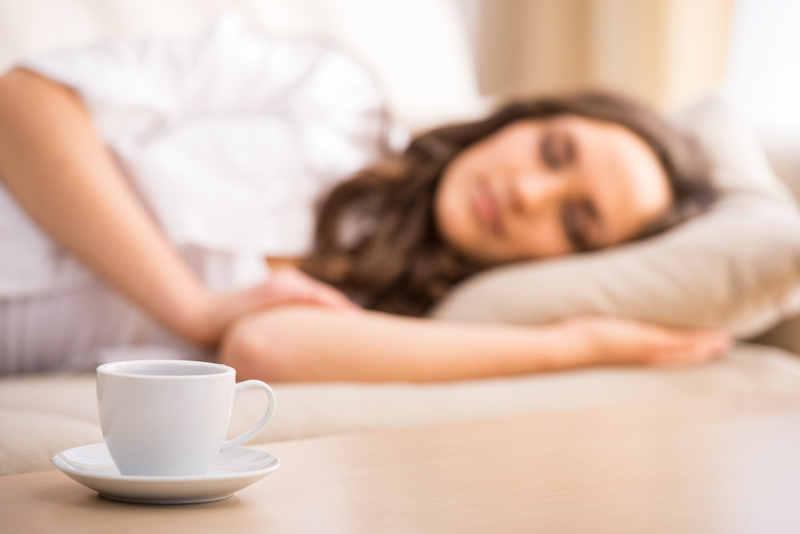 Despite its natural origins, Sleepytime tea has side effects, which may come as a surprise to some. But then, just because a product is naturally derived doesn’t mean it won’t have unexpected side effects in similar ways to over-the-counter and prescribed medicinal products made from chemicals. Here’s an example. Chamomile is touted as an excellent herb for helping people sleep because it calms the nervous system, but what many don’t know is that chamomile can cause allergic reactions in those who suffer from a ragweed and/or daisy allergy. These plants all belong to the same family, Asteraceae, and there is a risk of cross-reactivity. How long does Sleepytime tea take to work? This depends on the person, but the normal expected time would be within 15 to 30 minutes. Does Sleepytime tea work? Well, yes and no, and the answer depends on the individual. Not every herb in the tea will make every person equally drowsy after drinking it, and it isn’t fair to expect as much. The primary active ingredient in Sleepytime is chamomile. It’s been used to help calm the nervous system since antiquity. Another ingredient is tilia flowers, which can have a tranquilizing effect on the nervous system. The combination of chamomile and tilia flowers should induce calm and drowsiness, but try it for yourself and see. Perhaps you might take better to herbal concoction with valerian and passionflower in it, two other herbs with soporific effects. As with anything, there is a chance that a person could experience side effects from drinking this herbal tea. We’ve already mentioned the potential for cross-reactivity to chamomile in those with allergies to ragweed (even though this is rare). Below are a few other possible side effects. There is some speculation in the medical community that these flowers can cause cardiac damage when used frequently and long-term, though this is rare. Blackberry leaves are high in tannins, which can cause an upset stomach or even vomiting. If you have a sensitive stomach, don’t take the tea on an empty belly but rather with a light snack. Mint may lower blood pressure and blood sugar level, so talk to your doctor before taking this tea if you’re a diabetic and/or have blood pressure concerns. When pregnant you have to be very careful about what you ingest, especially when it comes to herbs. It’s best to discuss with your doctor which herbs are safe to take during pregnancy, and see if the ones in this tea are OK at these doses. If you’re having trouble sleeping, rather than lying there tossing and turning, you should get out of bed for 15 to 30 minutes and do something quietly. Then try to go back to sleep. Take a warm bath. The heat will help relax you. Drink a glass of warm milk. Do some exercise earlier in the day as it will help you sleep better at night, but give your body time to wind down and don’t exercise too close to bedtime. Meditate in the evening to help unwind. Try some breathing techniques to help you sleep. Some people have reported having Sleepytime tea nightmares, but there are many possible causes for nightmares, so it’s difficult to ascertain whether the nightmares came from the tea or something else. 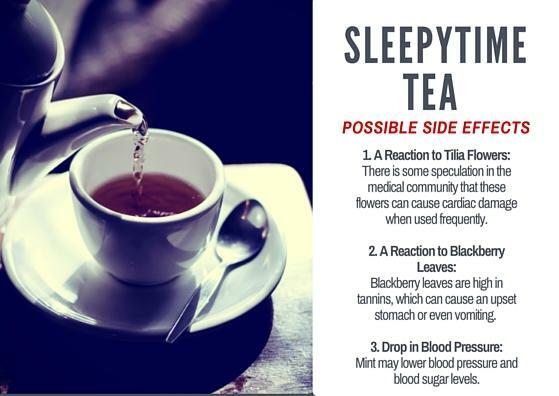 Another, stronger, brand of bedtime tea produced by Celestial Seasonings is Sleepytime Extra Tea, and its side effects are no different from the regular Sleepytime tea, except for the addition of valerian, a powerful sedative. Speak to your doctor before drinking this tea, especially if you are taking medications that might be contraindicated. Is Iced Tea Good for You? “Sleepytime Tea,” Just-Health. Net web site; http://www.just-health.net/Sleepy-Time-Tea.html, last accessed April 27, 2016. “The Side Effects of Sleepytime Tea,” Livestrong web site; http://www.livestrong.com/article/336160-the-side-effects-of-sleepytime-tea/, last accessed April 27, 2016. “13 All-Natural Ways to Fall Asleep Faster,” Huffington Post web site; http://www.huffingtonpost.com/2015/09/27/natural-sleep-aids_n_3882229.html, last accessed April 27, 2016. “Peppermint,” University of Maryland Medican Center web site; http://umm.edu/health/medical/altmed/herb/peppermint, last accessed April 27, 2016.